The ImageBrightness program allows you to selection an image file. When the image displays on the program window you can slide the knob left or right to change the brightness of the image. After you make change to the image, you can save the updated image in a separated file or override the original image file. 1 The paint method of the Canvas class has code to display the image. 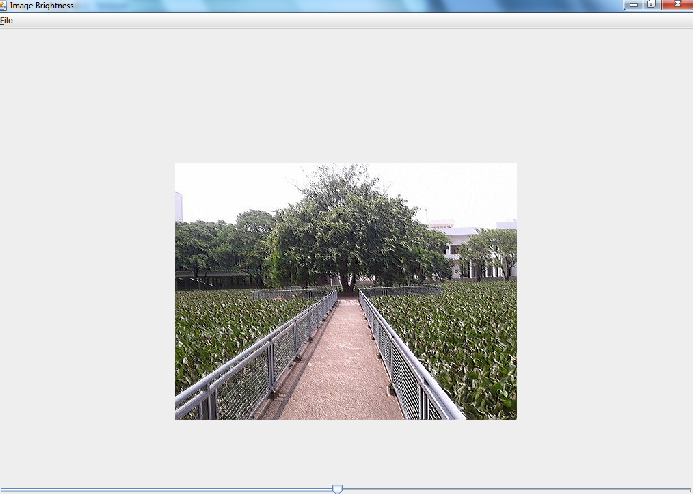 3 The filterImage method is implemented to transfer the result image or updated image to the BufferedImage object bimg for later showing and saving. 4 The setValue method has code to assign the value of the slider to the e variable of the ImgArea class. This value is used in the elements array that is used to construct the kernel object for image filtering process. 5 The setActionPerf method has code to assign the boolean value true or false to the actionPer variable of ImgArea class to indicate any change been made to the image. 6 The createBufferedImageFromImage has code to create an BufferedImage object from the original image. 7 The saveToFile method is invoked when the user select Save as... or Save sub-menu item to save the updated image to you current working folder. 8 The actionPerform method of the ActionListener interface is rewritten to enable menu items selection and do the action accordingly. 9 The setImage method displays the open file dialog for image file selection. 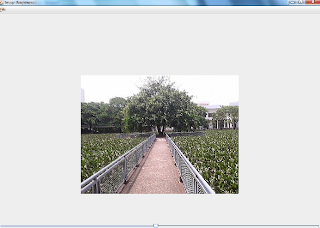 The selected image file will be sent to ia object(created from ImgArea class) for showing on the screen. dialog so the user can save the updated image in a separed file. 11 The stateChanged method of the ChangeListener interface is rewritten to track any change made to the original image. any change to the image. For more detain code explanation, please read the comments in code of the program.